In Minecraft, armor protects you from hostile mobs, other enemy players, and even from other items such as chicken eggs, falling anvils, lightning, cacti, and explosions. While armor can help safeguard your character, it does not make you immune to all types of harmful damage. Armor does not protect you in situations such as falling into the void, suffocating, or even drowning. However, your armor can also be enchanted to boost certain statistics or provide your character with certain abilities or extra protection. For example, the respiration enchantment can be applied to your helmet which allows you to stay underwater longer, which can help prevent you from drowning. Like the pickaxe and sword, armor loses durability over time (see the durability bar to learn how much durability you have left). It’s important to repair your armor to ensure it doesn’t break, rendering you completely vulnerable to damaging attacks. You can repair armor with a crafting grid or on an anvil. When you repair enchanted armor on the crafting grid, your repaired item has slightly more durability but loses any enchantments. However, if you repair the armor on an anvil, the armor remains enchanted. 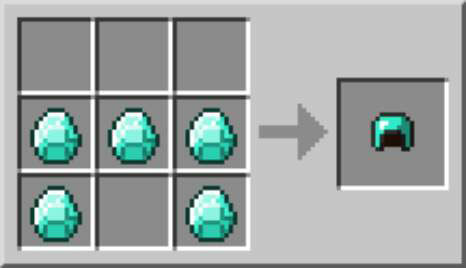 You cannot craft chain armor but can obtain it from mob drops or by trading with villagers. When it loses durability, you can repair it on a crafting table with iron ingots or on an anvil. You can also enchant chain armor. Not all pieces of armor need to be made of the same material. For example, a player can wear a leather helmet with a diamond chestplate and iron leggings. 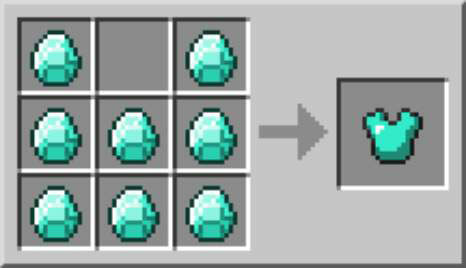 As rare ingredients become available, such as diamond, improving a single piece of armor is extremely beneficial. Leather armor is the least durable, but is also the most common beginning material. It is normally acquired by killing cows, but it can also be crafted from rabbit hide. To craft leather armor, you will first need to acquire the primary ingredient: leather. To do so, place 4 rabbit hides into a square shape in the crafting grid yielding one piece of leather. Though leather and golden armor are the least desirable materials for protection, they are the easiest to enchant. Also, leather armor can be dyed, which allows players to customize their character’s appearance. In order to dye armor in Minecraft, you will need a water bucket and a cauldron. First, add water to your cauldron. Then, select a dye in your hot bar and add the dye to the cauldron to change the color of the water. Finally, select the piece of leather armor and touch the cauldron with it. You have just successfully dyed your piece of leather armor! A helmet (or cap, when it’s made of leather) protects your avatar’s head in an attack. The helmet provides better protection than boots because the helmet provides more defense points generally. A leather helmet provides only 1 defense point (represented by half a shirt), and a diamond helmet provides 3 total defensive points. To craft a helmet in Minecraft, place 5 matching items (i.e. – leather, gold ingots, iron ingots, or diamonds) into a crafting grid in a helmet formation. The correct formation is to place 3 pieces on top (within one row) and 1 piece below on both the left and right side. The chestplate (or tunic, when it’s in leather form) is stored in the second inventory slot and provides protection for the upper body. A chestplate provides significantly more protection than a helmet due to the increased defense points the chestplate gives you. So, craft your chestplate first if you have sufficient ingredients and upgrade to a stronger material as soon as possible. 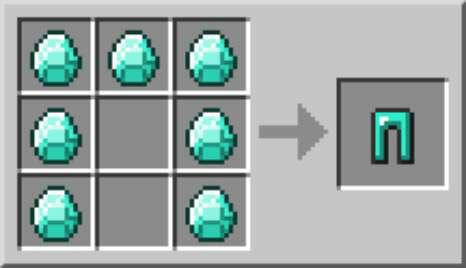 To craft a chestplate in Minecraft, you place 8 identical items into a crafting grid. The chestplate recipe is roughly shaped like a shirt within the grid, with only one box being empty (top row, middle column). Leggings (or pants), which are stored in the third inventory slot, provide the second-highest level of protection. You should craft your legging armor early in the game and upgrade it whenever materials become available. 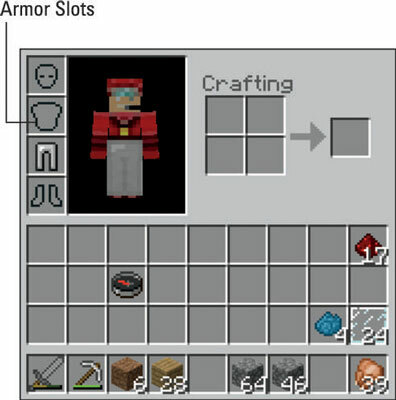 To craft legging armor in Minecraft, place the 7 identical ingredients in the following formation: 3 items in the left column, 3 items in the right column, and one item in the middle column, top row. The recipe for leggings should look like an arch shape that looks like pants in the crafting grid. The least effective piece of armor, and the one stored at the bottom of the inventory screen, is boots. But don’t be fooled into thinking that boots are not a vital part of armor. They offer defense points, and they can be enchanted for additional properties. For example, boots can be enchanted with a depth strider enchantment increase underwater speed or enchanted with a feather falling enchantment reduce fall damage. To craft a pair of boots in Minecraft, you need only four identical items. Place the items in the following order: bottom and middle box of the left column and bottom and middle box of the right column. Though all items can be enchanted with various abilities, helmets and boots have unique enchantments that make them particularly important pieces of armor despite the low number of defense points they provide. The magnificent armor stand is a true marvel. In Survival mode, you can only currently place armor and mob heads on to armor stands. In Creative mode, customizing the NBT tag will allow you to add arms; rotate the head arms and legs; take away the bottom plate; make the armor stand invisible; make it not have gravity; and even make a mini one! Learn more about how to pose and equip armor stands in Minecraft. Just right-click the armor stand to put on and take off armor. Another cool feature about the armor stand is that it is an entity. That means it has gravity, can be picked up with minecarts, and can even be moved with pistons. At the bottom of an armor stand is a stone slab plate. The legs are two sticks, which extend all the way to the shoulders. The waist is one horizontal stick, along with the shoulders. The head is one vertical stick. To craft an armor stand in Minecraft, place a stone slab in the bottom middle box, then place two sticks above that slab. The middle row should read, from top-to-bottom, stick / stick / stone slab. Finally place sticks in each of the four corners of the crafting table, as seen below.